The Poinsettia Bowl is being played close to Christmas (usually around the 23rd of December) and matches-up a team from the WAC and the MWC (often the #2). As of November 2009, the San Diego County Credit Union has extended its title sponsorship of this college football bowl game through 2010, with options for 2011 and 2012. Mentionable is also, that the bowl donates $1 for every ticket sold to the San Diego Chapter of the Make-A-Wish Foundation. The 2011 Bowl game was played on 12/21/2010 at 5pm local time (8pm EST), matching-up TCU Horned Frogs and the Louisiana Tech Bulldogs. The game was televised on ESPN. TCU defeated Louisiana 31 to 24 and will be heading to the Big 12 Conference in 2012. After a fourth-quarter deficit (the 3rd time in the 2011 season), TCU was able to call this Bowl game a victory. This TCU win was also the 8th straight victory for a Mountain West Conference champion. Louisiana came into the Bowl with a 7-game winning streak and almost won their 8th game, but it turned out differently. The 2010 Bowl game was played on 12/23/2010 at 5pm local time (8pm EST), matching-up the San Diego State Aztecs, representing San Diego State University with the Navy Midshipmen, representing the United States Naval Academy during the 2010 NCAA Division I FBS football season. The game was televised on ESPN. The Aztecs were able to capitalize on a slow-starting Midshipmen team resulting in a 35-14 loss for Navy. After 1.5 million gallons of rainwater was purged from Qualcomm Stadium, the Navy defense was up to its neck with the potent and balanced offensive attack of SDSU. The Aztecs’ freshman running back Ronnie Hillman scored four total touchdowns and earned 228 yards on the ground on 28 carries. Hillman’s performance broke the previous Bowl mark of 129 yards by Navy’s Adam Ballard in 2005 and etched SDSU’s first bowl victory since 1969. Festivities for the 2010 game kick-off in downtown San Diego's historic Gaslamp Quarter started at 6 p.m., Tuesday, December 21st with the Poinsettia Bowl Gaslamp March. The host hotels are the Hilton San Diego Bayfront at 1 Park Boulevard, San Diego, CA 92101, Phone: (619) 564-3333 and the Manchester Grand Hyatt at One Market Place, San Diego, CA 92101, Phone: (619) 232-1234. And last, but not least, the media hospitality room will be located at The Omni San Diego Hotel . The 2009 Poinsettia Bowl on December 22nd, 2009 featured the Utah Utes and the California Golden Bears. Still pretty new on the list of college bowl games, since its inception the bowl has seen Navy (2005), TCU (2006 and 2008) and Utah (2007) as winners. Utah won that game 37 to 27. The 2011 and 2012 games will feature MWC teams going up against top schools from the WAC (Western Athletic Conference). A WAC school has played in the bowl game once. And then in 2013 a bowl-eligible Army team will make their first appearance in the Bowl. The last time the Black Knights played in a post-season game was in 1996 in the Independence Bowl. They lost to the Auburn Tigers 32-29. Should Navy or Army not be bowl eligible in their respective years, the bowl game will receive a team from the WAC. To become bowl eligible a team must earn six wins. And Navy is close to getting there. 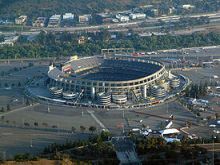 Qualcomm Stadium has a capacity of 70,561 and is located in the heart of Mission Valley, just minutes from downtown San Diego. Besides this event, the Stadium also hosts the San Diego Charger and SDSU Aztec football, the Holiday Bowl, Street Scene and more. Buy Poinsettia Bowl tickets now and be one of those enthusiastic fans at Qualcomm Stadium. This is a game that is a recent addition to the sports tickets scene, but given its location and venue, the bowl will no doubt soon be joining other games as a prime reward for two teams who've enjoyed great seasons. Not to mention, you can use your college bowl tickets to see a great game and then enjoy all that "America's Finest City" has to offer.